2Wheel Chick: Wanna do the Tour of Sardinia ? 1. The Giro Sardegna takes place over one week in April, from Sunday to Saturday. This year it took place in the third week of the month. Sometimes it can be earlier. 2. The location of the event varies from year to year. 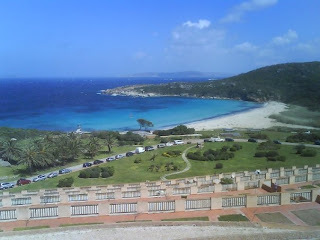 This year it was based on the North coast near the town of Santa Teresa Gallura. Last year it was based at Orosei, on the East Coast, and in 2006 it was based around Alghero. The terrain will therefore vary depending on the location, but expect the rides to be undulating, with at least one stage being a summit finish. 3. There are actually four week-long events that run concurrently during the week. All of them have a stage every day. I did the Gran Giro and survived. Any club rider who has done cyclosportive events will be able to do the Gran/Medio giro. A good road racer will do well, especially in the Medio Giro. Roughly equal numbers of people do the Gran and Medio giro. Fewer do the other events. 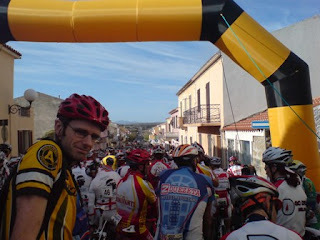 The 2007 edition of the 1,000km of Sardegna was a qualifier event for the Paris-Brest-Paris audax. 4. The stages are all timed using a timing chip. The results of each stage are published at the end of each day, along with the General Classification. A daily prize-giving ceremony, with a tombola/raffle also takes place. 5. In the competitive events (Gran Giro/Medio Giro) the level is very high at the top end, as riders from prominent amateur Italian teams take part. Emmanuele Negrini, a winner of various Gran Fondos and cyclosportives including La Marmotte, is a regular participant at the Giro Sardegna. Ex-pros Massimiliano Lelli and Vladimir Smirnov took part this year. 6. That said, various levels of rider take part in the events. The minimum speeds for the stages are quite generous. 7. You are not obliged to do all of the stages, but of course if you miss one you will no longer be in the General Classification (GC). If you miss the team time trial you will still remain in the GC but you will just be given a time penalty. Some people have also been known to switch between the Medio Giro and Gran Giro rides, but again that will lead to being declassified in the GC. 8. During the rides large pelotons can form - up to 50 riders. However, there are outriders and escorts to ensure the safety of the riders on the road. Motorists are very cycling friendly. Furthermore, the semi-professional teams will also have team cars and support personnel following. 9. During the race there are generous feedstations, mechanical/medical assistance and a sag wagon if needed. 10. Around 50 women (out of a total of 800) take part. The women in contention are not only very strong, but they will have a dedicated team of male "domestiques" pacing them round the course. Generally, the Italian men will "look after" any woman that they see trying hard during the race ! 11. The goody bag is generous. This year we received a big holdall bag and a T-shirt. If you think you are likely to be in contention during the races leave extra space in your luggage for your prizes on the return journey home ! People generally receive boxes of wine, large baskets of local produce plus bike bits and pieces. Women should not be offended if they are given things like pasta making machines, legs of proscuito, aprons or other kitchen items ! It's an Italian thing ! 12. The field is quite international. Obviously most of the riders are Italian, but there's a sizeable chunk of Germans, Dutch and British riders. There are also riders from further afield - United States, Canada, South Africa. 13. If you don't speak Italian there are people who help translate. Furthermore, the Peter and Anne outfit are there to co-ordinate things for the English speakers. They will organise bus transfers to/from the airport, as well as put riders together for the team time trial, and keep you updated on the latest news. 14. That said, speaking Italian will be very helpful for knowing exactly what is going on during the prize giving ceremony/event briefing session (which is conducted in Italian only). And of course, knowing the lingo may gain you new Italian friends. Andiamo - Come on, let's go ! Bocca al lupo ! - Good luck ! 15. If you would like to do the 2009 edition the venue/details will be announced around September time by the organiser, Tonino Scarpitti on the Girobike/Mare e Monte website. It is unlikely that the event will be in Santa Teresa Gallura next year. There is a possibility that it will return to Orosei (which was a much appreciated venue last year). Otherwise there's even a chance that the Giro Sardegna will be based on a boat in Genoa and then sail out to do stages in Corsica and Sardinia. Now that would be something else ! It has now been confirmed that the 2011 event will take place from 23rd - 30th April and will be based around Arborea, near Oristano. hey there my dear.. its me Yvette!!! I see u have you eyes on Dolomiti Stars.. hence u should come and stay with me! Hope all is well.. let me know your movements in 2008... be good to see you!! still have the sweet man? ?